K 4 Premium Full Control Home 13241050 https://www.kaercher.com/ae/home-garden/pressure-washers/k-4-premium-full-control-home-13241050.html Pressure washer with pressure indicator on the trigger gun – for the right pressure on any surface. Includes hose reel and Home Kit. Ideal for moderate levels of dirt. Area performance of 30 m²/h. Pressure washer with pressure indicator on the trigger gun – for the right pressure on any surface. Includes hose reel and Home Kit. Ideal for moderate levels of dirt. Area performance of 30 m²/h. The pressure washer with hose reel for occasional use on moderate levels of dirt. For an area performance of 30 m²/h. 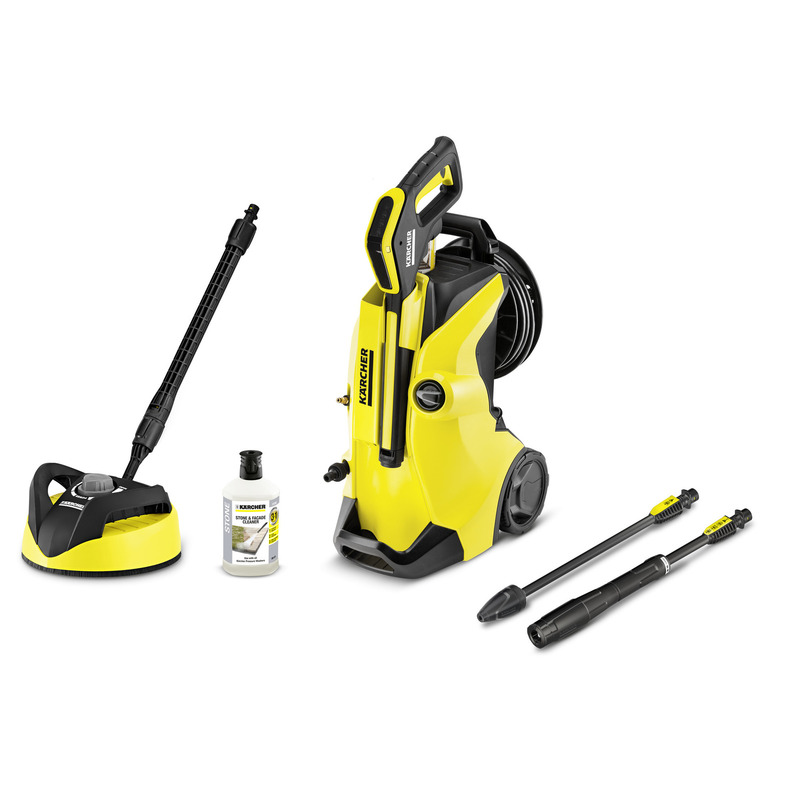 Includes Home Kit with Surface Cleaner T 350 and 1 litre of the Stone Cleaner 3-in-1. With the Full Control pressure washer, you will find the right pressure for any surface. The pressure setting is adjusted on the spray lance and can be viewed on the LED display on the trigger gun – for maximum control. You can switch from high pressure to detergent mode without changing the spray lance. The trigger gun is within easy reach and can be parked, together with the spray lance, during brief interruptions in cleaning. Thanks to the height-adjustable telescopic handle, you can move the device around at a comfortable pulling height and store it compactly. And with the easy-to-use Plug 'n' Clean system, you can change detergents in one easy motion and check the filling level at aglance. The pressure washer also offers a lower centre of gravity for greater stability, a practical hose guide and a sturdy base. The base can also be used as a second carrying handle, making it easy to lift the device onto a shelf or into the boot of a car.